The story is of two little sisters who watch their backyard apple tree grow through the year. In winter, the tree is bare and brown and as Spring arrives the tree grows leaves and blossoms. Petal start falling down and green apples appear in place. In Summer, green apples get bigger. Finally, in autumn, the girls pick the ripe apples and help their mother and father bake a delicious apple pie. We also liked the way the author, Zoe Hill interleaved the story of the family of robins that lives in the apple tree. In Spring when the leaves appear, two robins build a nest. When Tiny buds appear they lay eggs and guard them. The Buds bloom and the baby robins hatch. The birds grow feathers as the blossoms grow and learn to fly when the petals begin to fall. In Summer, the birds have grown up and fly away but they visit the apple tree daily. At the end of the book, the author has a step-by-step description of how bees help apples grow through pollination and a yummy Apple pie recipe. We love the beautiful, colorful collage Illustrations by Shari Halpern. Very impressive! The Inspiration is from our very own Apple picking post using magnetic pom poms. CJ and I enacted the Apple Pie tree story to Daddy using magnetic pom poms and Magnetic Tree cut outs. Magnetic Apple tree parts ready! Now time to play! Our tree has grown an apple pie! It smells so good! Spring with Blossoms: We didn't have many pink magnetic pom poms, So it was CJ's idea to add pink alphabet magnets as Blossoms. She wanted it to be colorful so she added other color pom poms too. Summer- Green Apples: Same as Spring! WARNING: CHOKING HAZARD -- Small parts and Magnets. Not for children under 3 yrs. Oops! Did I forget the Apple pie? Stay tuned for the Apple pie Recipe! What a lovely way to explaore all 4 seasons !! Adorable. 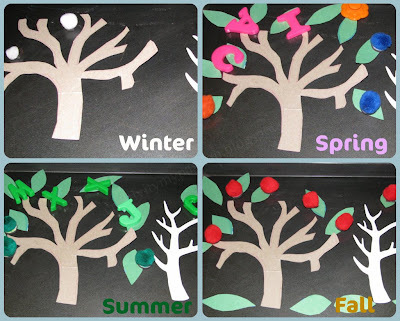 Fabulous way to explore the seasons. Hi Esther, thanks for your comment on The Keybunch. My first time here, and I am loving it! Esther, this is awesome! What a great activity!!! We'll definitely be making this! Thank you Mandi! Good to have you back! Esther...I just loved the book turned into activity.And lovely playful method to teach CJ about season. This is such a great idea! I love how your tree changes for the seasons! I may have to try this! Looks so fun! I LOVE this idea... Do you have a pattern for the trees? Thanks. Sorry Nita! I don't have a pattern, I just free handed the tree pattern!